Super excited to announce that this acrylic on canvas panting of the Roebling Bridge has now been sold. After finishing this piece nearly five years ago, it’s appeared in a few gallery shows then due to it’s large size it spent most of the time in the studio as we enjoyed it while we worked on other paintings. Until about two months ago when Brad Wainscott owner of a new restaurant in Covington, Kentucky, Libby’s Southern Comfort reached out and asked if I had any artwork to display in his new space. After this painting of the Roebling Bridge proudly hung on the walls for just a round a month a woman came in for lunch and enjoyed some of the amazing goetta hushpuppies and also wanted this painting. It’s always fun to see the final resting place of your artwork. Upon delivery of this painting I was able to help the owner up to their magnificent home overlooking the beautiful Cincinnati Skyline. It was like a dream come true to sit there and take in our beautiful city from the comfort of her home. Always inspired by the Cincinnati Skyline you can check out our entire portfolio of skyline paintings here. This piece is rather large at 48″ x 90″ and took some time to complete and a fun history to it. Now notice all the texture in the background? There’s a story to that. This painting actually lived three lives. The first one it was the actual Frischs Big Boy holding his hand up, but instead of a burger he was holding the city of Cincinnati. Then decided to paint over that and we did the ivory towers of Procter and Gamble. It stayed like that for a while then we decided to paint the suspension bridge. Here’s a few photos of the painting hanging at Libby’s Southern Comfort as well as a view from its new home. Enjoy! Here’s the final capture on this Cincinnati skyline painting titled, Cincy in July. The customer’s wanted to capture the beautiful skyline in greyscale tones to hang in their contemporary home with modern decor. Excited to deliver this painting and help hang it on the wall this evening. Here’s final capture of our latest painting of the Cincinnati Skyline inspired by the view from across the Ohio River in Covington Kentucky. To just stand there and soak in all the colors in the buildings reflecting and dancing into the water is a treat to the eyes. This is seriously one of my favorite portraits of the city so far. Looking forward to rocking the next one. 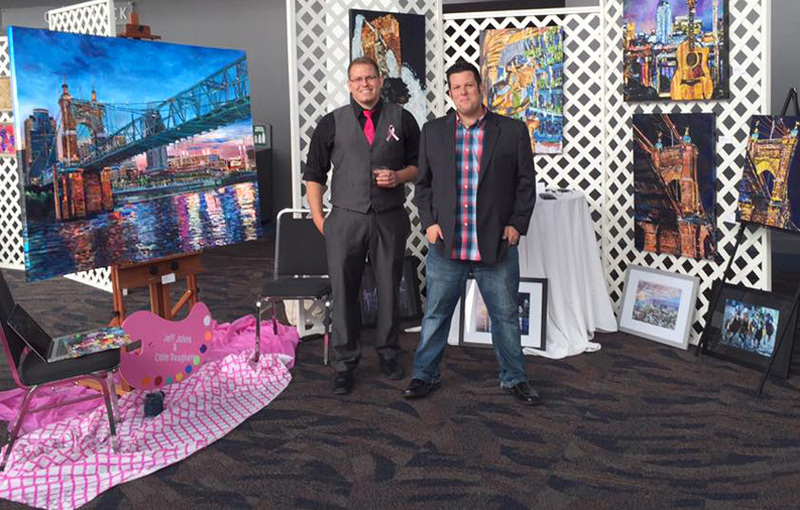 It was an honor to be featured artists “live painting” the 2015 Pink Ribbon Luncheon, Cincinnati at the Duke Energy Convention Center this year. Such a great experience to meet so many people and showcase our true passion for painting with others and to top it off, a percentage proceeds from sales went to support breast cancer care. 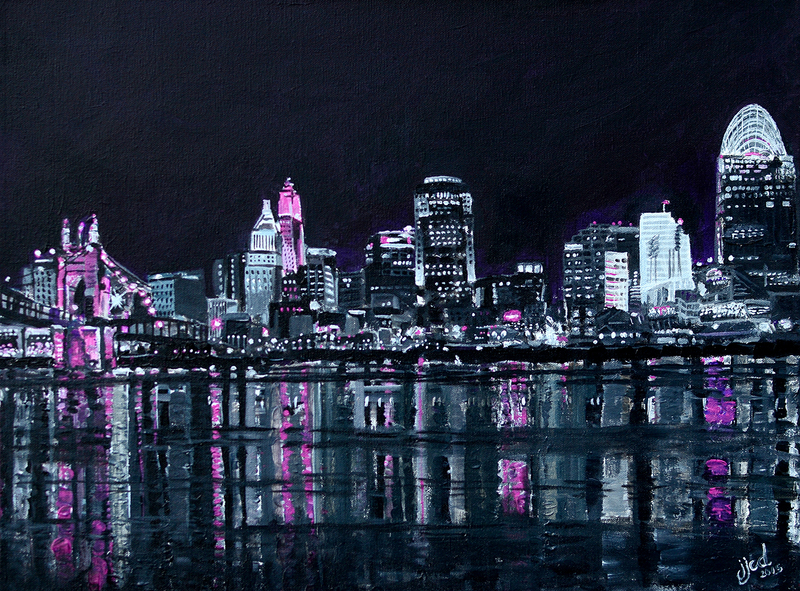 We started to gear up for the event by working on a cityscape painting of the beautiful Cincinnati Skyline. We worked it in grey-scale first then decided to add pink and really Pink the Town. What an event, not only did we support such a good cause, we also met a ton of great people and make some really strong connections while doing what we love to do, and that’s paint the beautiful Cincinnati Skyline. A collection of arwork on display at the Pink Ribbon Luncheon by Jeff Johns and Colin Daugherty, JJCDcollaborations. Here’s a capture of our latest Cincinnati Skyline painting. The idea behind this painting was to drive awareness and support for Breast Cancer. This piece was created strictly as a donation for the Pink Ribbon Luncheon, in Cincinnati at the Duke Energy Convention Center. This piece will be featured in an online auction available for bidding early October 2015. Really hoping that this piece drives awareness and brings a good return to help the Chris Collinsworth ProScan Fund Pink Ribbon Luncheon.